In nature alpacas met their nutritional needs by roaming to find plants, licking on mineral deposits and other plant material and consuming fresh, clean water free choice. Farmers now confine their livestock to dry lot paddocks or pastures. Our product choices support feeding alpacas either free choice or scheduled feedings. 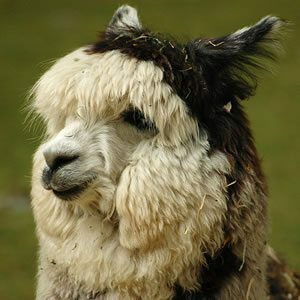 Based on current research camelids (alpaca/llamas) require approximately 25 ppms (parts per million) of copper in their entire diet. Anything below this amount may result in a deficiency. Anything above 500 ppms may be toxic. Copper is found in all feeds and forages. It is recommended that your forage be tested to determine its copper levels. Based on this research, the recommended sources of feed below are considered “low copper” for sheep, alpacas and llamas. Many people believe that animals know what their bodies need and when they need it. In nature they would find it. Alpacas certainly can’t roam far to meet their nutritional needs. We offer products that support free choice feeding for your herd. SweetPro lick tubs are an all-natural, non-UREA, non-molasses*, non-starch free-choice lick tub. They contains protein, vitamins, minerals, yeast, live enzymes, and pre-biotics, for improved digestion and feed efficiency. SweetPro’s Sheep Blocks: Our Sheep Blocks are all-natural, non-molasses, non-starch free-choice lick tub. It contains vitamins, minerals, yeast, live enzymes, pre-biotics, and diatomaceous earth. There is no added copper to these tubs (contain 25 ppm). It comes in 50lb, 125lb a 250lb sizes. We expect sheep to consume between .25 to .50 lb per day per animal. Consumption depends on quality and amount of forage, condition of the animal, whether pregnant or not, time of year and stress/illness factors surrounding your sheep and other potential factors. Our tubs are designed to be fed year around for desired health benefits and weight gain. Please check with your veterinarian first. Redmond Naturals consist of sea salt and volcanic ash (toxin binder) conditioner. These products can be fed free choice or in scheduled feedings. If you are looking for salt, we recommend Redmond Natural’s sea salt with over 50 trace minerals. The Redmond salt blocks come in a 44lb Lick Block version or bagged salt in 50lbs bags or 2,000lb totes. There are many types of salt in fine, medium or coarse grade size. Redmond Conditioner is a wonderful source of mineral and toxin binder and is available in 50lb bags or 2,000 totes. SweetPro’s Fresh Start with Diatomaceous Earth is great if you prefer to feed your alpacas in a TMR format we suggest feeding. Fresh Start is an all-natural, non-molasses, non-starch loose supplement that is intended for hand feeding. Fresh Start contains all the protein, vitamins, minerals, yeast, live enzymes, pre-biotics and diatomaceous earth for nutritional needs. Fresh Start can be ordered in 50lb bags or 2,000 lb totes. Please note that Fresh Start is suitable for all ages of cattle. Fresh Start is fed at 1 oz. /100lbs of body weight per day. Redmond Naturals: Redmond Naturals provide a sea salt and volcanic ash (toxin binder) conditioner. The salt and conditioner are available in 50lbs bags or 2,000lb totes.